A great source of information is your local tack shop. 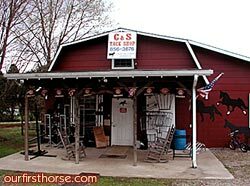 Halfway between the town where we live and the closest “big city,” tucked off the highway where you would never know where it is except for a roadside sign, is the best little tack shop around: C&S Western & Tack Shop. They have EVERYTHING there – tack, barn stuff, shoeing supplies, grooming supplies, boots – you name it. And the owner, Charlie, really knows his stuff. He’s been a great source of information and advice for us. He knows just about everyone in the area, too, so he knows who to talk to if you need something he doesn’t have (like hay). There’s a bulletin board full of resources in the shop, too. Charlie is also one of the nicest people we’ve met in a place full of nice people, and he has the best stories. If you’re ever in Greenback, Tennessee, look them up!